A perennial favourite, younger children love this sturdy board book with all itsinteractive features stroke the sheeps wool, find Josephs tools under theflap, and lift the curtain on the stable window. 14 pages, from Hunt & Thorpe. 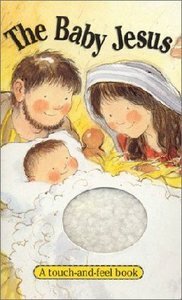 About "Touch-And-Feel: The Baby Jesus"
The story of the Baby Jesus for younger children with interactive features. Designed for pre-school children, this interactive book tells the story of the baby Jesus. Children can stroke the sheep's wool, look for the Wise Men's presents or lift the curtain on the stable window.